You are here: Home / Ask an Expert / How Can I get the Most Value From My Business Blog? How Can I get the Most Value From My Business Blog? Blogs are great for promoting key messages and distributing information about a brand, company or organizations. Starting a blog can be a valuable tool to help businesses sell their products while making better connections with customers, but it’s not as simple as slapping up some content. Creating a blog that is seen, shared and respected takes some research, strategy and consistency. Here are a few tips that I incorporate at Online Marketing Blog which other companies can follow to increase the value their corporate blog provides. Research & Use Keywords. Optimize your blog for search engines. Use a keyword research tool to create a keyword glossary of words related to your brand, business, topic or industry that are in demand. Content creators should use the glossary as a reference for planning, writing and publishing content online. Create a Content Plan. 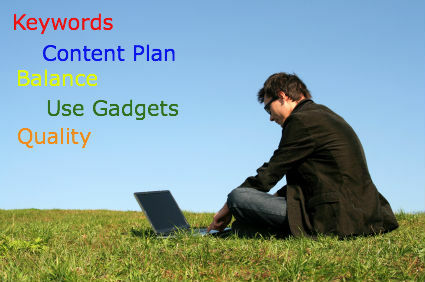 Create a structured, yet flexible content plan for your business blog. Assign topics and keywords to any planned articles, blog posts, curated news and other content. Its okay to expect some “wildcard” posts in case breaking industry news occurs, as long as content creators expect to consult the keyword list when posting. Use Keywords Everywhere. Have you noticed a theme? Keywords are a blog’s most important feature for attracting organic traffic, but repetitive use in body text can turn readers off. To increase keyword density without sacrificing content quality, use keywords everywhere: In post titles, anchor text for URLs, tags, post categories, image alt text, audio and video title names, metadata, etc. Create Valuable Content. Varied, compelling content draws readers back frequently to check for updates. Include wide-ranging content and formats in your blog posts, as they relate to your business, brand or industry. Some examples of types of posts that are popular include lists, FAQs, how-tos, interviews, industry news, current events, photo spreads and infographics. The Three Cs. Get some of your content from the outside your organization through Curation, Comments and Crowdsourcing. Share posts from important blogs in your industry. Write posts that address poignant comments. Create surveys, polls and contests that result in content from your target market. Give audiences motivation to participate. Don’t forget to link – outbound links attract inbound links! Quality Over Quantity. Some people post once a month, others by the week and even a few swear by blogging every day. But the quantity of posts that you publish isn’t as important as the quality. Quality over quantity will keep the readers of your business blog engaged and coming back for more. Balance. Find a balance of optimizing blog text keywords and context for readers and search engines: Don’t forget that your target reader isn’t a computer. Offset curated content with original content. Find the right timing, for you and your brand, to publish new posts and remain consistent. Incorporate Gadgets. You can share your work, but truly successful blog posts are distributed far and wide by zealous readers. Encourage this with gadgets embedded in each post or on each page, like RSS syndication feeds, widgets for social bookmark sites and buttons to instantly share posts via Twitter, Facebook or other social media sites. This gives more visibility and can help to build more links. Getting the most value from a business blog takes a little knowledge and a lot of strategy, but it doesn’t have to be time consuming. Follow the tips above and you’ll be well on your way to reaping the benefits blogs can provide to companies.